A meteorologist uses computer graphics to enhance our understanding of high and low pressure systems. In the still-shot above, find the area labeled ‘H’ for high pressure (to the left of the weatherman); above this is a convergence of air flows. When the upper air is cool its molecules move closer together; they converge. When air is warm, molecules move away from each other; this is called rarefaction. Acting like a vacuum, the evacuated spaces of rarefied air Pull cooler air into it to fill the gaps. Note that the vertical arrow points downward in a high pressure system; the air descends from above, spattering outwardly (clockwise and centrifugally, shown by the purple arrows) as it compresses against the ground level air. Now find the area labeled ‘L’ for low pressure (to the right of the weatherman); above it is a divergence of air flows. In a low pressure system, as the warmer upper air flows diverge, the cooler ground level air is Pulled upward (the vertical arrow points upward), funneled into a vortex, which, in severe low pressure systems, could become a devastating tornado. 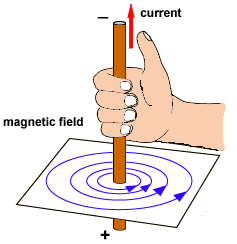 Purple arrows are spinning counter-clockwise and centripetally. High pressure systems occur when the temperature in the air above is cooler than the air below. Low pressure systems occur when the temperature in the air above is warmer than the air below. The wind tends to blow from a cool area to a warm area, even laterally, as it does from sea to land. To participate in a guided activity, please pretend that the surface of your computer display is horizontal instead of vertical. Imagine the graphic below to be flat on a surface that you are viewing from above. To mirror a low pressure system, rest your right hand on the graphic above, centered on the ‘L’ (low pressure system). Make a fist and lift your thumb, which should be pointing upward (or toward yourself and away from the screen). In a low pressure system the cool air at ground level rises into the warmer air aloft. The illustration above mirrors a low pressure system. To mirror a high pressure system we reverse the procedure. Point your right thumb downward (toward the computer screen), so that it touches the ‘H’ on the left side of the graphic. This feels a little awkward, but you should be able to tell that your fingers are now coiling in a clockwise direction, aligned with the high pressure system graphic. In a high pressure system the cool air above descends (thumb down) into the warmer air at ground level. Movement of air not only moves from cool to warm vertically, but it also moves from high pressure to low pressure laterally at ground level. 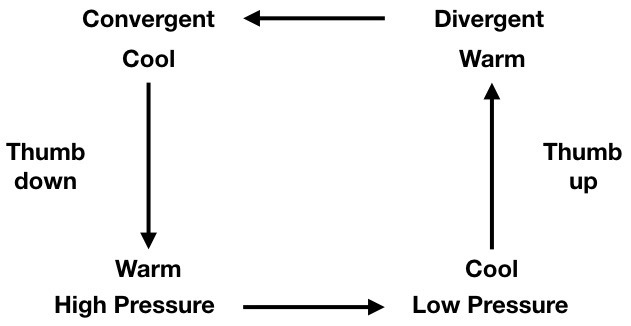 These systems, as shown below, are in a relationship, evidenced by the arrows connecting the high pressure system on the left to the low pressure system on the right. With your growing knowledge of Quadernity, you are surely by now suspecting a four-quadrant circuitry. Oh, please, say it is so! The arrows depicting the upper air flows reflect convergence and divergence. These horizontal arrows are pointing to the right; however, to make a full circuitry they should be pointing to the left (see the graphic below the photo). The producer of the weatherman’s graphics is uninformed about Quadernity, so he/she did not think that far. Using the lens of Quadernity, we recognize that, in the upper air-stream, the air in the low pressure system on the right, which is diverging in a counter-clockwise direction, has to flow back into the high pressure system, which is converging in a clockwise direction. Let us follow the feedback loop full circle. Beginning in the upper left corner of the graphic below, trace the arrows around the circuit. This graphic corrects the still shot of the meteorologist several paragraphs above. But wait! you say, “Doesn’t cold air flow toward warm air?” Yes it does, unless the warm air is under higher pressure than the cool air, as is the case with our two systems at ground level. The lower two quadrants represent the ground level wind, which moves from high to low pressure regardless of the relative temperatures. This was also shown in the section just above this one, where the two systems were related by arrows connecting them, high to low. “What about convergence?” you ask. “Isn’t the density of convergent air molecules more pressurized than the rarefaction of divergent molecules?” Another astute question! Good on you! Even though convergent and pressurized air are both showing Spin, there is a difference between them. When molecules in air pull themselves together, we call it convergence. When molecules in air are pushed together by an outside force, we call it pressurization. Molecules that are close together (regardless of how they got that way) tend to move to wherever they can meander about with ample freedom. Heat causes divergence; and divergence within a limited boundary increases pressure against the boundary wall. Coolness causes convergence and lower pressure against the boundary wall. The oscillation of pressure gradients keeps everything in motion. If all pressure gradients are neutralized, molecules would cease to move. Consider our Spin and Span labels as you follow the arrows in the graphic reprinted below. 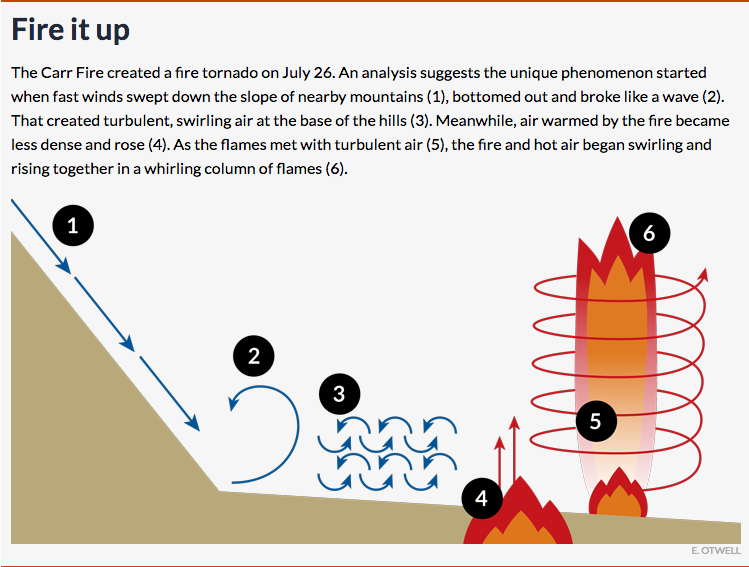 Look for the same sequence in the illustration below (reprinted from this article) of how massive fires reproduce the weather necessary to fuel the fires. Our new terms, Spin and Span, allow us to organize our insights in a way we may not have thought of before. Both Female and Male Spin and Span. High pressure (Female) and divergent warm air (Male) are special instances of Span. Low pressure (Male) and convergent cool air (Female) are special instances of Spin. Both clockwise movements (1 & 2 from numbered list above) are Female (ULQ & LRQ in the Chalkboard Quadrants). Both counter-clockwise movements (3 & 4) are Male (LLQ and URQ). Quadernity has made a case for the four-quadrant circuitry, but to assure you that I am not forcing the issue, let’s think it through just a bit more. When the warm air rises and rarefies, it eventually cools enough to stop diverging. In other words, divergence is self-limiting. The convergence of cool air increases pressure, which heats the air, halting the convergence and initiating divergence. Convergence is, therefore, also self-limiting. If the two vertical systems of our example were independent of each other, the high pressure system would Span out at ground level and lose its energy potential, and the low pressure system would Span out through the divergent upper air stream and lose its energy potential. In both cases, the systems would be exhausted after only a momentary blip on the weather-screen. However, we know that some weather systems last for days. How so? Consider what happens when high and low pressure systems are conjoined. Instead of the warmed high pressure air simply Spanning away from the high pressure system, never again to be useful to it, the warmed air cools and enters a low pressure system nearby. This cool ground air is Pulled upward in a counter-clockwise Spinning vortex, warming to enter the divergent air flow above. As the warm air Spans outwardly in divergent air streams, it again cools and replenishes the cool air that feeds back into the original high pressure system. The low pressure system is reset by input at ground level, and the high pressure system is reset by input in the upper air stream. Through feedback, each system recovers its energy potential from the other. The two systems are united. Together they co-operate to improve sustainability. We can all take a note. Cooperation can make us all winners.